On a chilly and grey sky June morning, over 100 women entrepreneurs gathered together at OPEN Sandton for the latest Lioness Lean In breakfast event in the city, ignoring the cold weather and enjoying the chance to network and be inspired. 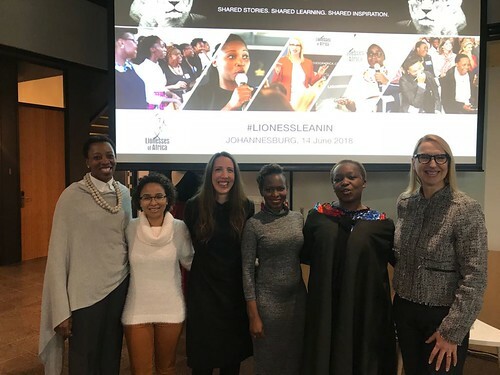 Johannesburg Lioness Lean Ins are always known for the warmth of the welcome that women entrepreneurs experience when they get together at these events, and on 14 June, that was certainly the case. After coffee and pastries, everyone gathered in the funky auditorium at OPEN Workspaces ready for an inspirational morning ahead. The programme got underway with a welcome from Lionesses of Africa Founder and CEO, Melanie Hawken, who spoke about how good it was to be back in Johannesburg following the recent Lioness Roadshow around Europe and the African continent. She spoke about the power of community and the unique network of women entrepreneurs being built in each of the countries and cities she has been travelling to over the past weeks and months. 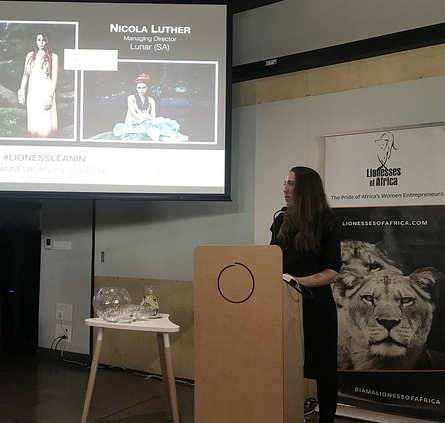 Melanie then introduced Nicole Chalkley of OPEN Workspaces, the impact partner and cohost for the Lioness Lean In Event in Johannesburg, who spoke about the range of facilities and support services available for women entrepreneurs at OPEN. The programme got underway in earnest with Melanie Hawken talking about the importance of getting access to global markets for Africa’s women entrepreneurs, and sharing a video from the recent Startup Night! Africa London event. She explained how the women entrepreneurs who were showcased from Africa at the event, all inspirational global brand builders in their own right, were now taking the opportunity to leverage the exposure and build new opportunities in the city. Melanie invited the wonderful Swaady Martin, founder of Yswara and one of the pitch presenters at Startup Night! Africa London event, to share her experiences of being part of the event, and what she took from the experience. She also shared her considerable knowledge and insights of her journey to building a successful luxury global brand in Africa. Next up to the speaker podium were the three guest speakers for the morning. Firstly, Andiswa Silinga, founder and managing director of Gemini GIS & Environmental Services in South Africa gave a real insight into the world of geospatial mapping and the use of drone technology to provide essential data for the mining, construction and energy industries. Fascinating stuff! Next came Faith Katsaura, founder and managing director of Zuva Printers in Zimbabwe. She shared her story of building a successful printing business despite all the odds and challenges during the tough economic landscape in the country. The third guest speaker was Mozambican chocolatier, Sefora Noor, co-founder of Kakawa Chocolates, the first home-grown chocolate company in the country. She shared the wonderful story of how she and her three childhood friends, now 3 doctors and 1 architect, created a passion driven chocolate brand that people love. The final part of the programme for the morning came in the form of a new Lioness Launching feature, giving women entrepreneurs the opportunity to showcase their new product or business launches. This time, two women fashionpreneurs from South Africa took to the stage to announce and present their winter collections, and to share their business stories. Brigitte Mashile, founder of Roka Roko, and Nicola Luther, ceo of Lunar, both wowed the audiences with their distinctive fashion approaches and styles. 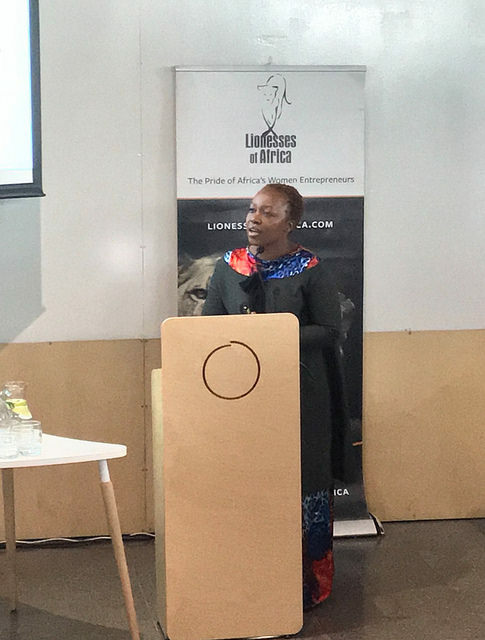 Lionesses Founder and CEO, Melanie Hawken, brought the event to a close by celebrating the guest bloggers who are part of the Lionesses of Africa community and invited other women entrepreneurs to join in and write regular guest blogs that can inspire others. She brought the formal programme to an end with a call to all the women entrepreneurs attending to join the Lionesses of Africa community, to share their startup stories, to sign up for their daily and weekly newsletters and radio shows, and to apply for the forthcoming Lionesses of Africa Digital Accelerator. The event ended with a special prize draw, featuring gifts given by women entrepreneurs in the Lionesses of Africa network. Unaiza Moideen, founder of the Brow Bar, gave every woman attending a special voucher for a brow treatment at her wonderful salons - this was a real hit with the audience. Next Vicky Bain, founder of Chocoloza, the outstanding artisan chocolate brand in Johannesburg, gave everyone in the audience a chocolate taster from her latest collection, and one lucky winner walked away with a fabulous gift box of chocolates. Finally, a special gift of luxury perfume created by South African perfumier, Di Thompson, founder of Dimanzi, proved to be a real winner and won lots of new fans on the day.